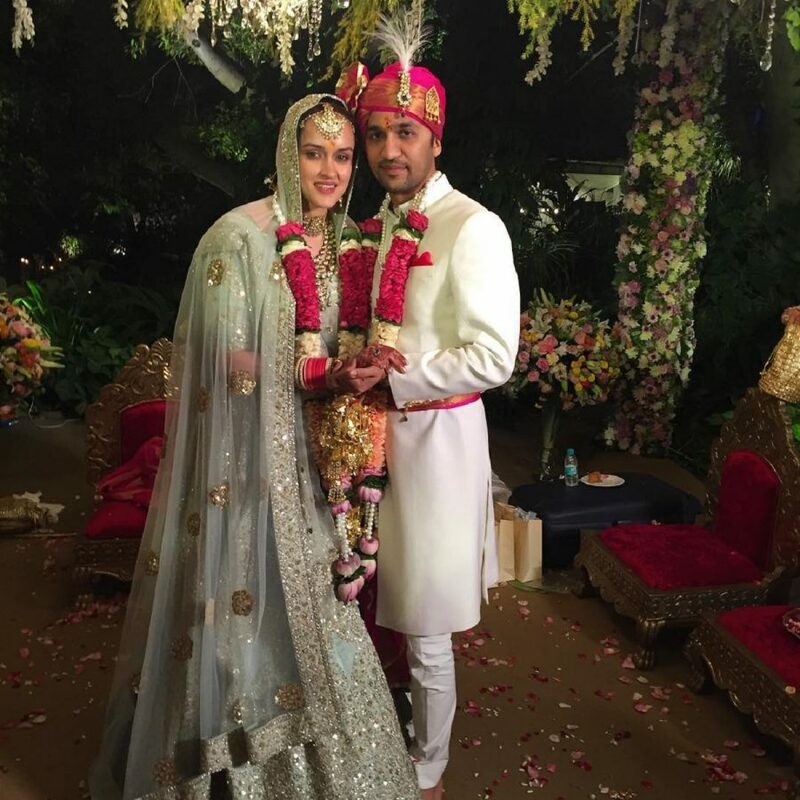 Aisha actress got married and gave 9 steal worthy ideas from her wedding! 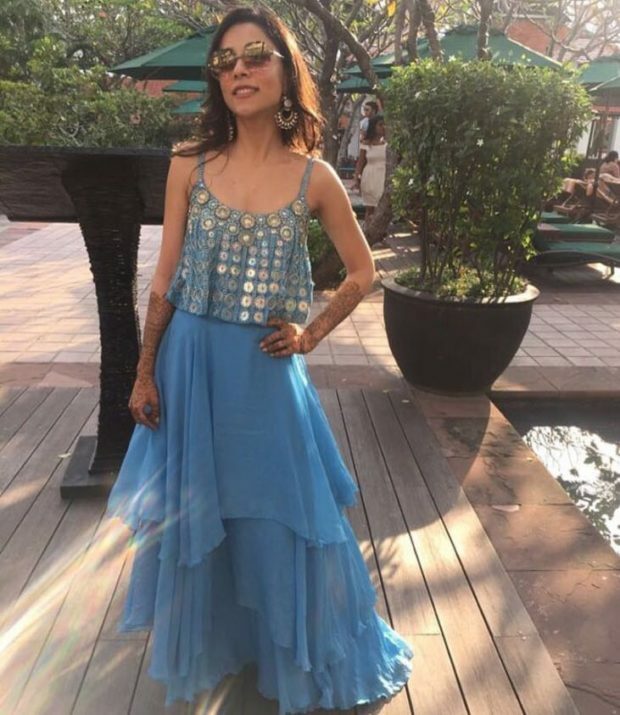 Amrita Puri is the quintessential ‘cute as a button’ celebrity we all doted over post her successful debut in Aisha and later in Kai Po Che. 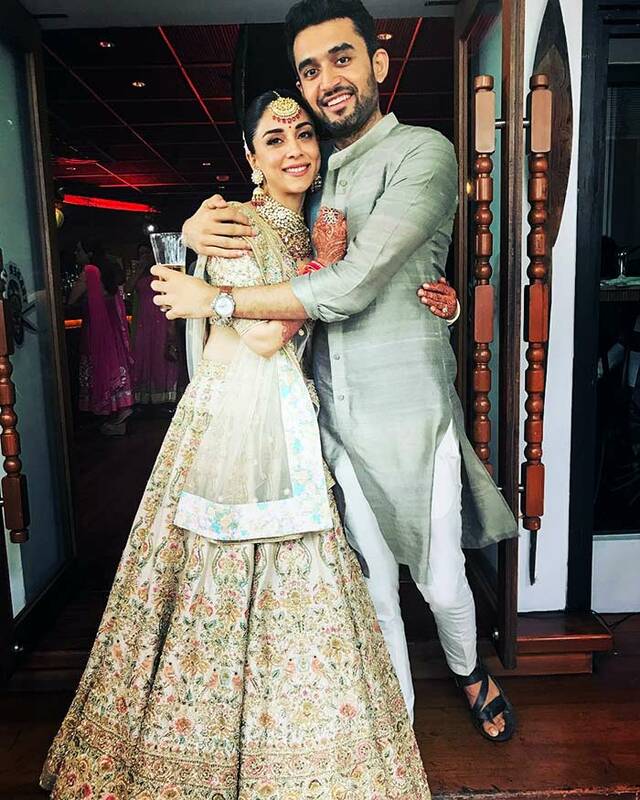 Social media is flooded with gorgeous moments from her picture-perfect destination wedding with her beau Imrum Sethi in Bangkok, and for the right reasons. 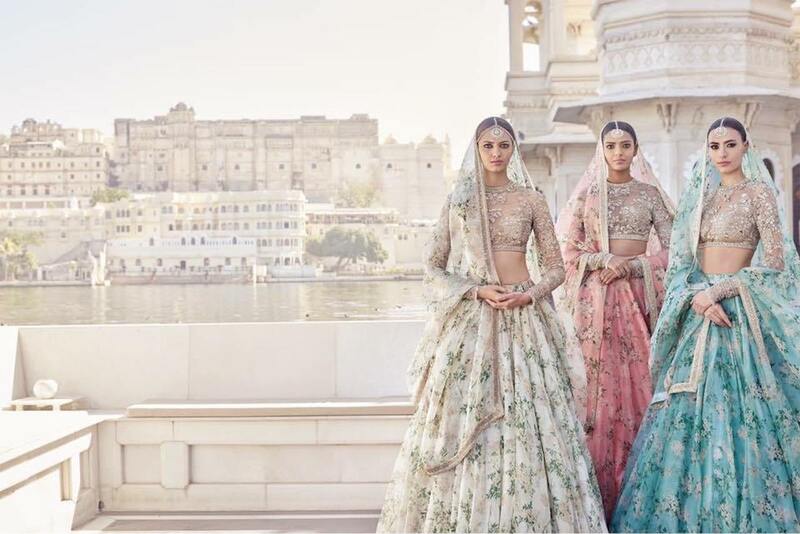 Owner of the design label Akuri by Puri herself, Amrita’s wedding fashion is definitely on point and a mix of everything lovely, both traditional and modern. 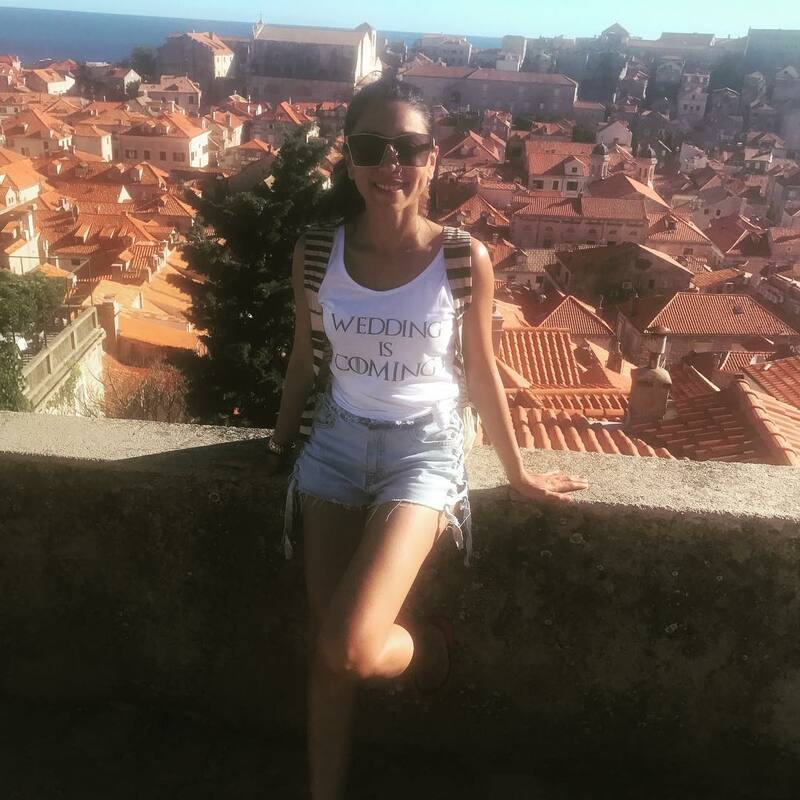 Bachelorette in Croatia & “Wedding Is Coming” Tank Tops! 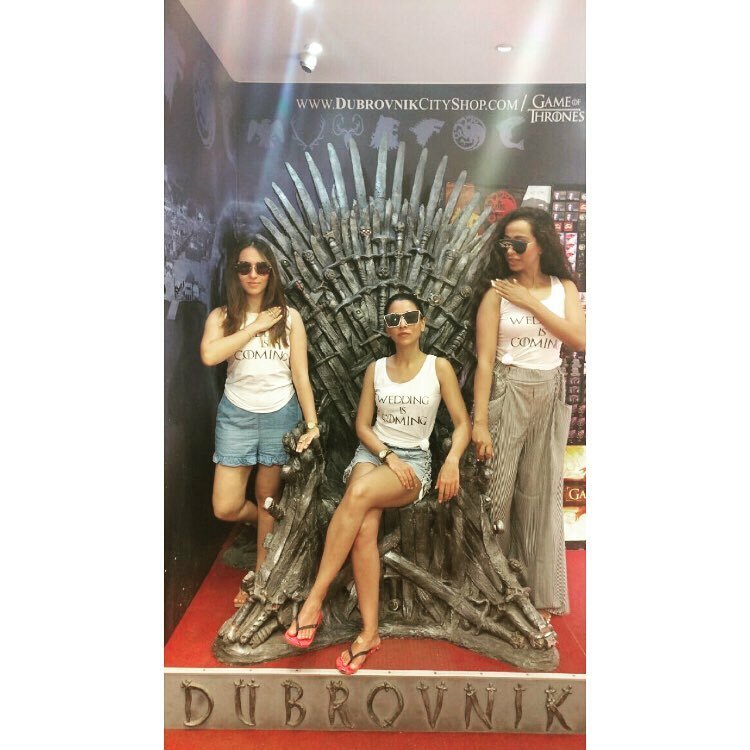 Amu chose Dubrovnik in Croatia as the destination for her Bachelorette and we love her bridesmaids’ Game of Throne’s inspired slogan tank top which says Wedding is Coming. An idea worth stealing! 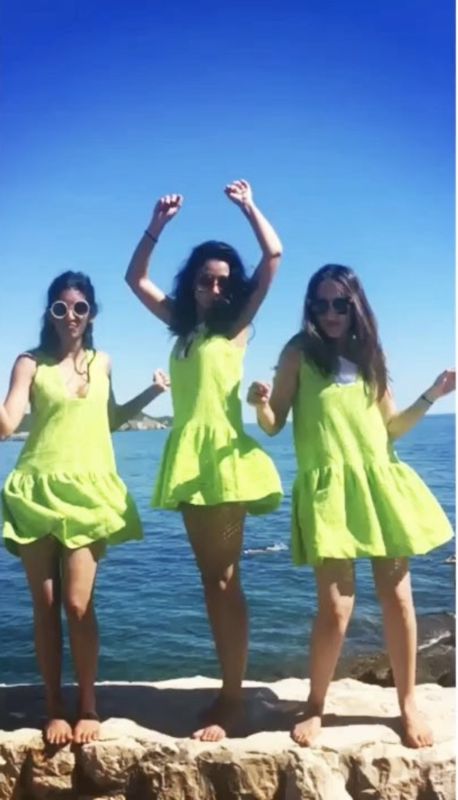 We also love the coordinated cover-ups from Amrita’s own label. 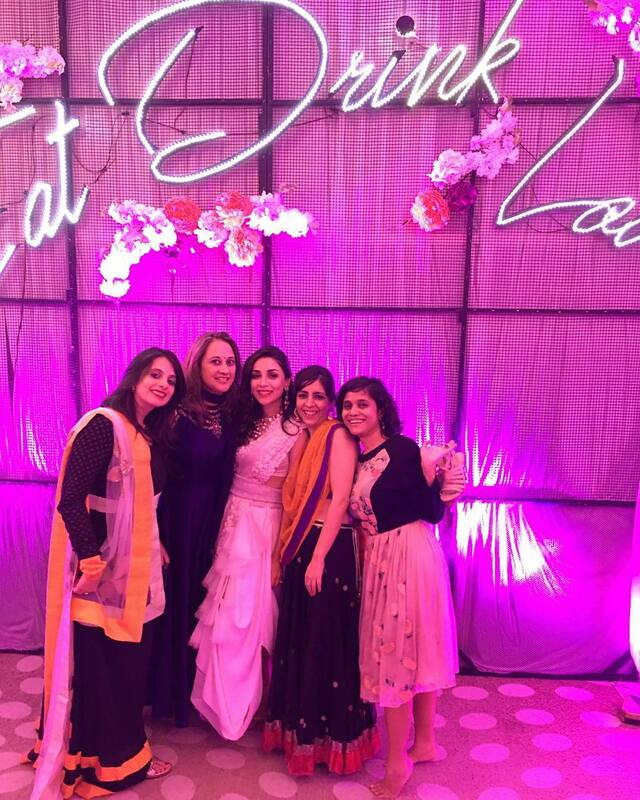 For her pre-wedding get-togethers, she chose to be an easy going bride with understated yet super stylish outfits. We love her super long earrings which she wore with a striped crop top and ruffled skirt. 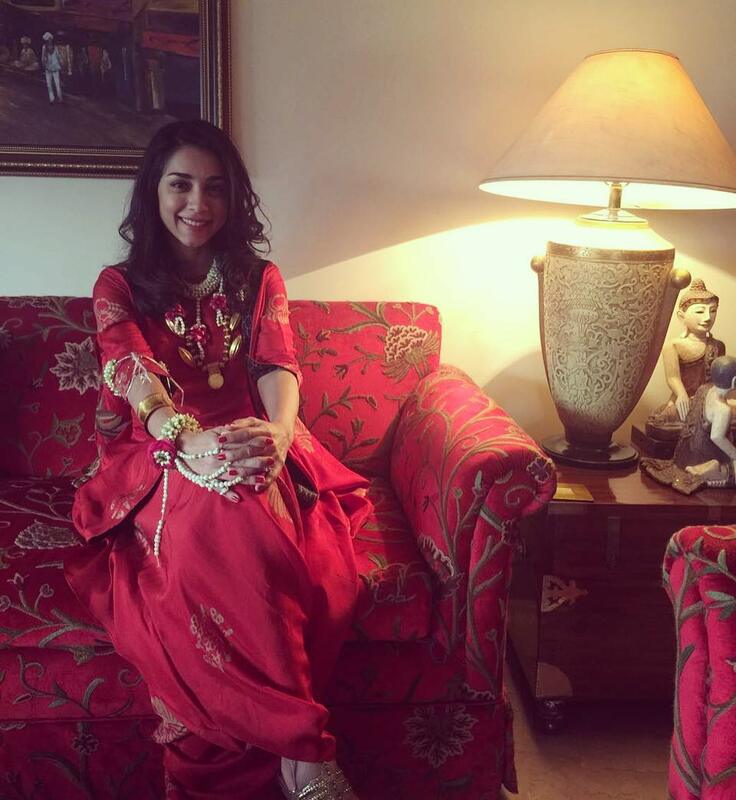 She looked so pretty in this red dhoti-cape ensemble, that she accessorised with floral jewellery. 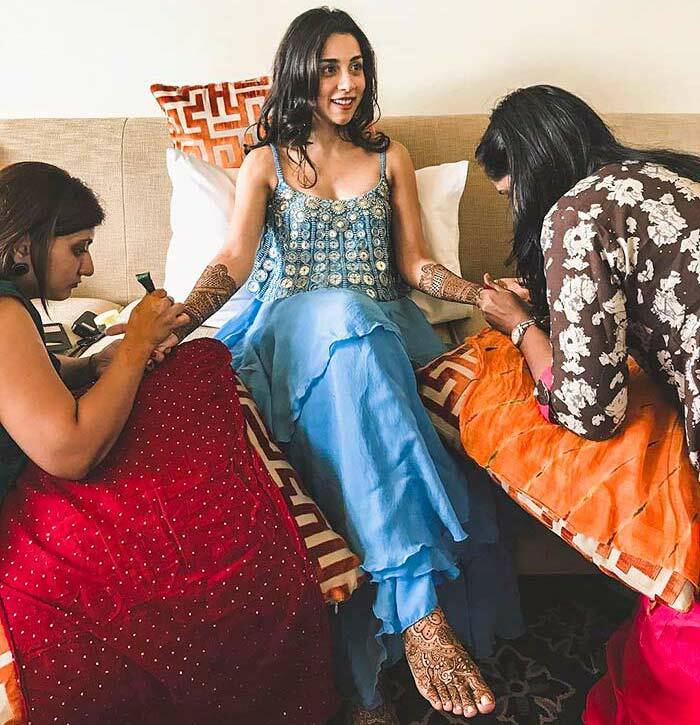 We are in love with her easy breezy mehendi outfit which not only looks super practical and comfortable for the function, but also looks super pretty! The layered skirt and embellished cami are by Amrita’s designer-friend Ritika Mirchandani. 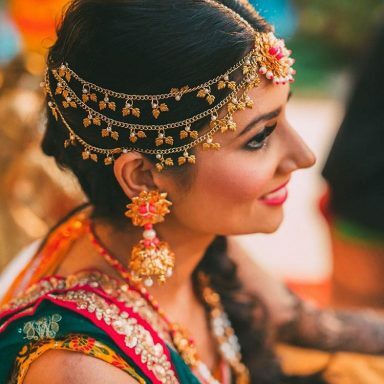 Super Unique Sangeet Outfit That’s Going To Start A New Bridal Trend! 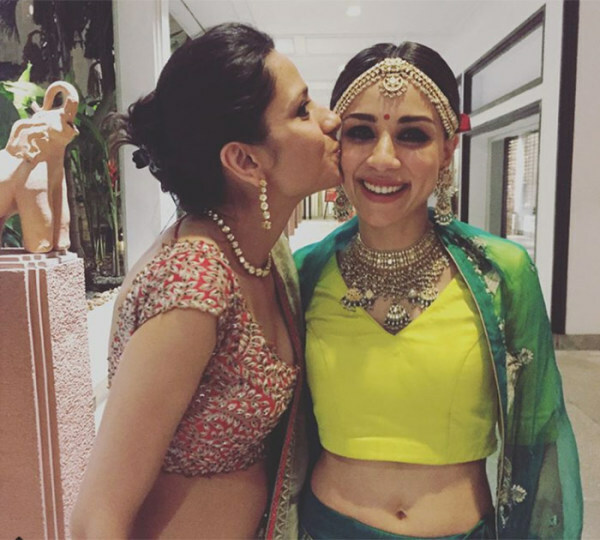 She wore an ivory dhoti sari on Sangeet night! <3 It’s subtle and sophisticated, yet full of details. The styling was on point with an ornate cape and embellished belt to accentuate her tiny waist. We’re going to be recommending this look for Sangeets now! 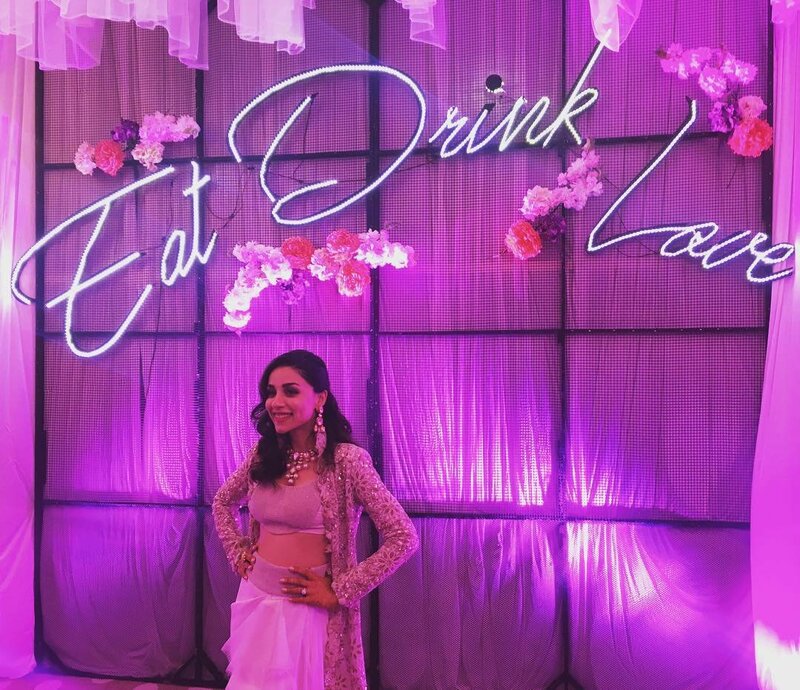 The slogan ‘Eat, Drink, Love’, the centrepiece of the decor, was pretty apt for sangeet night. 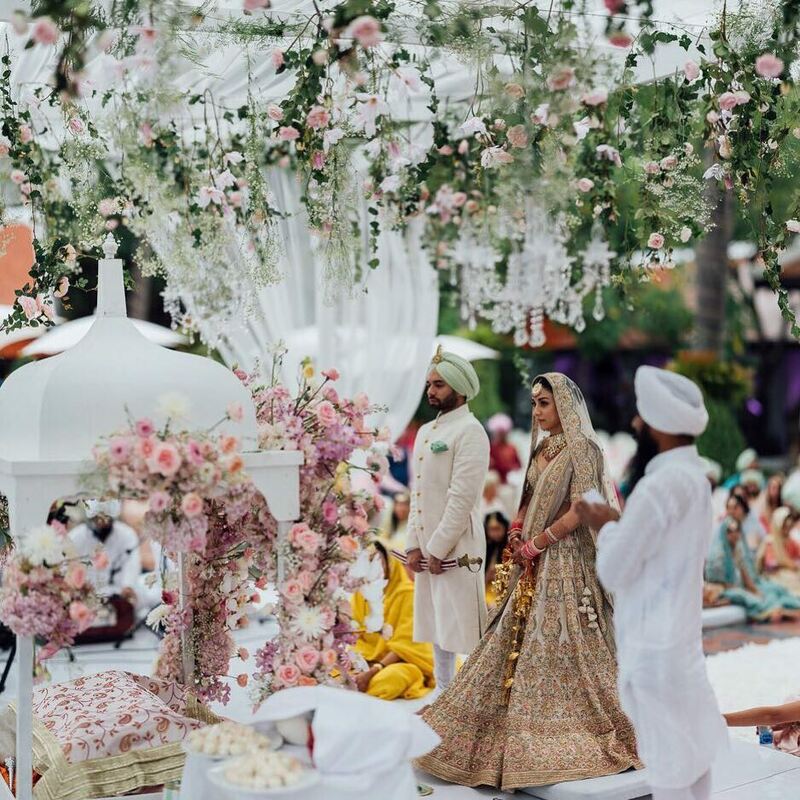 Amrita had two weddings, a traditional Sikh wedding in the day, and a Hindu wedding in the evening, and she looked incredible in both her looks. 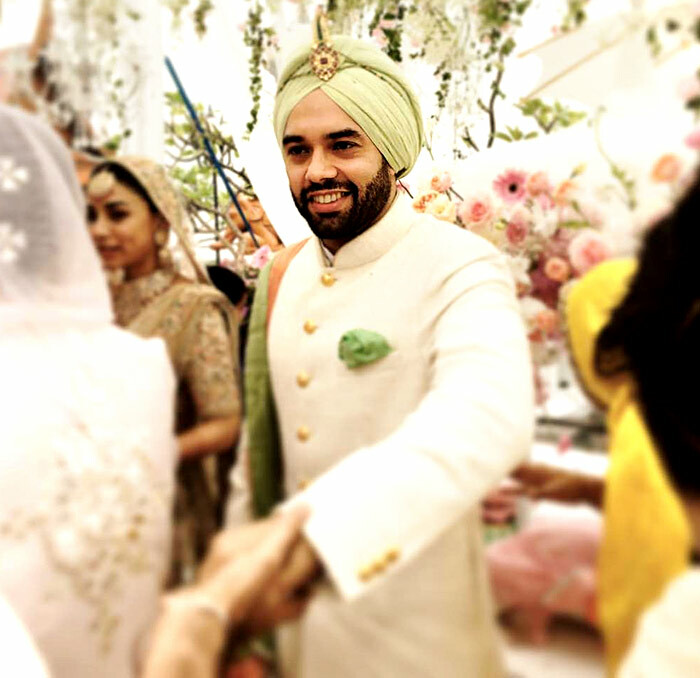 Sikh Day Wedding in Pastels, Whites & Sabyasachi! 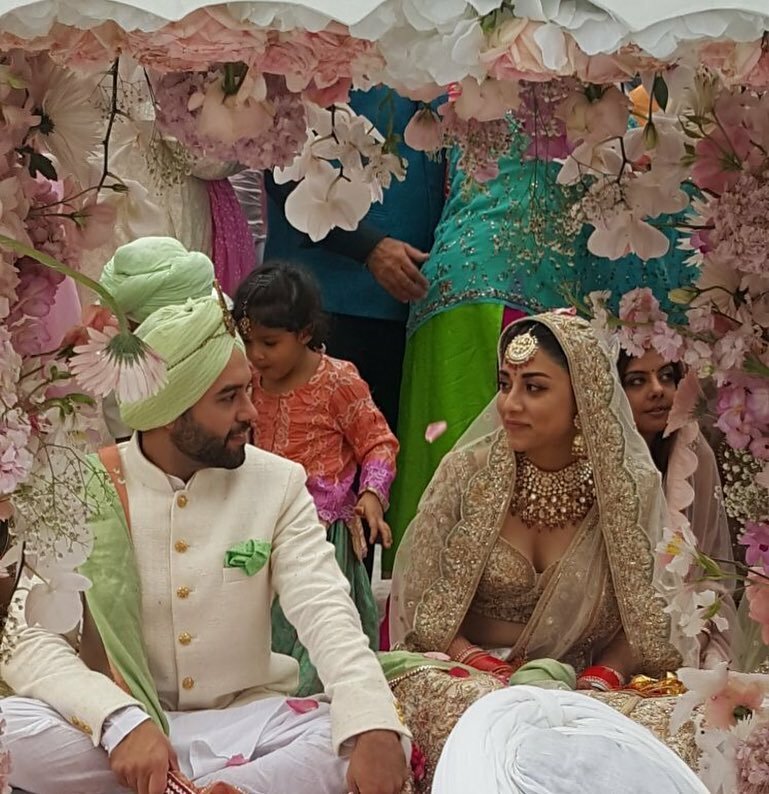 The bride wore an ivory lehenga by Sabyasachi with some gorgeous embroidery, while her groom added a hint of colour to the couple portraits with his soft green safa. We loved the muted bridal makeup look, which is a rare find on celebrity brides! 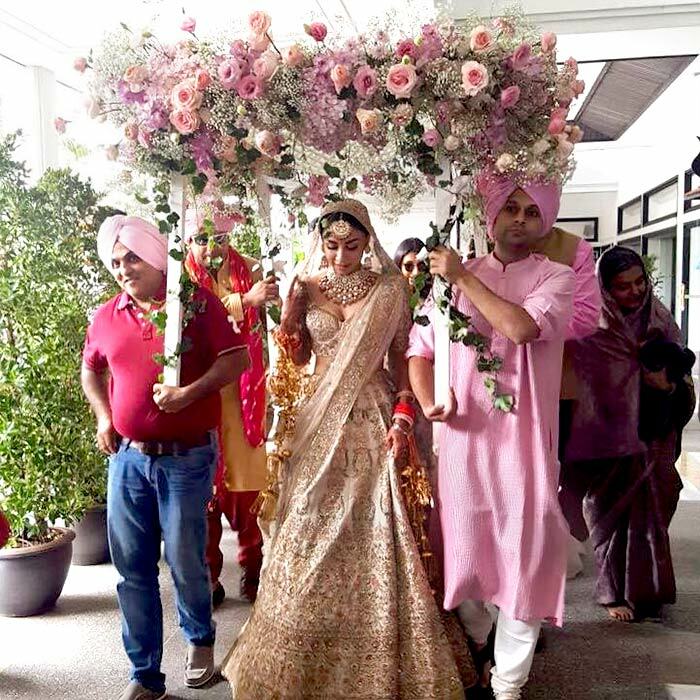 Do NOT miss the beautiful phoolon ki chaadar that overflowed with blush pink & pastel purple flowers. 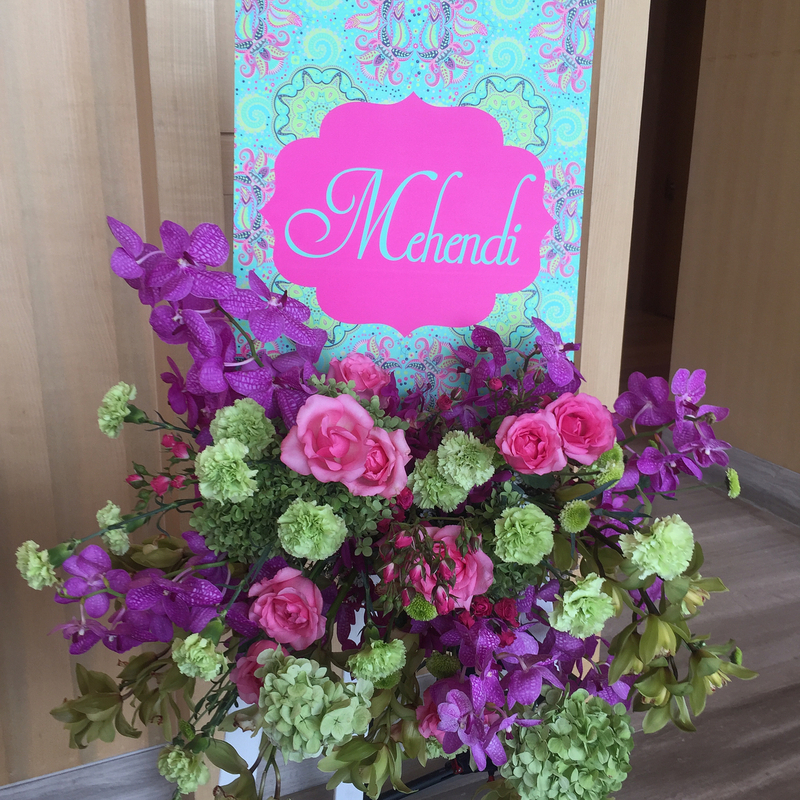 And the rest of the decor that continued in the same colour theme. 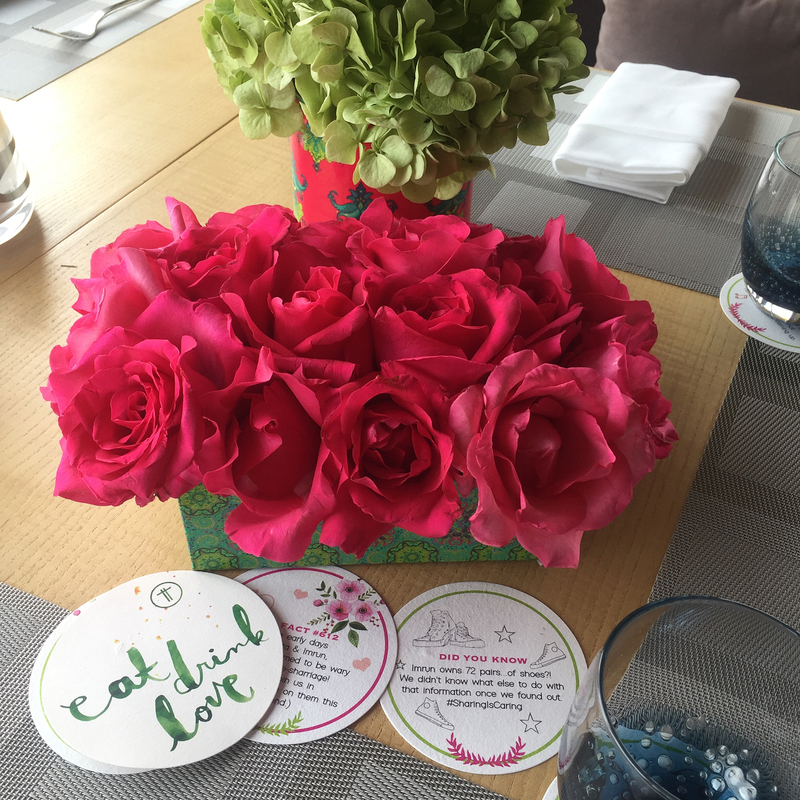 Love the fun facts coasters with some facts about the cute couple. 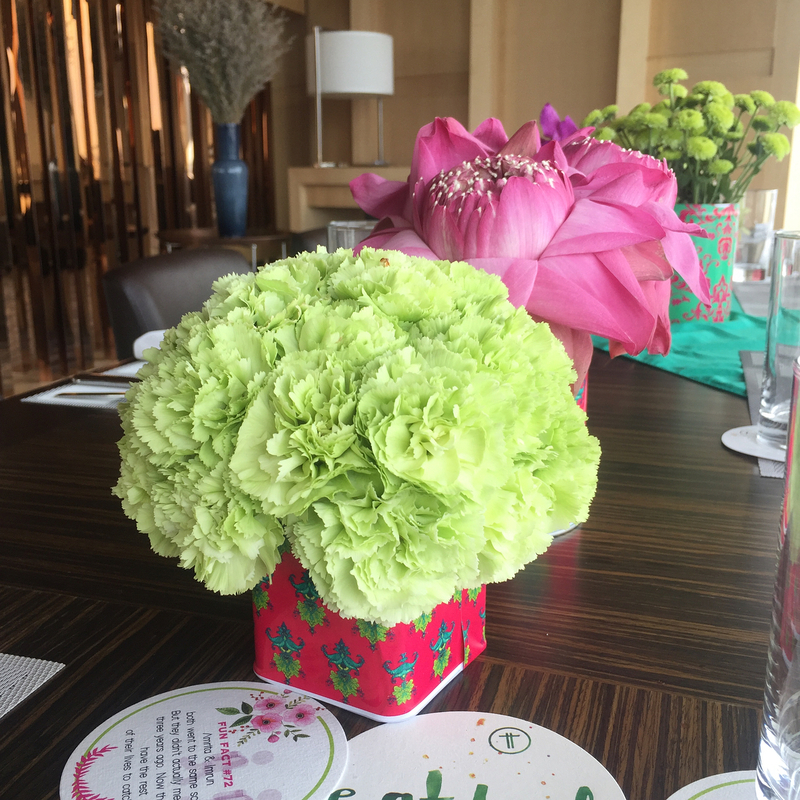 Elan Events did a great job with the decor, take a look at the vibrant flower arrangement and centrepieces. 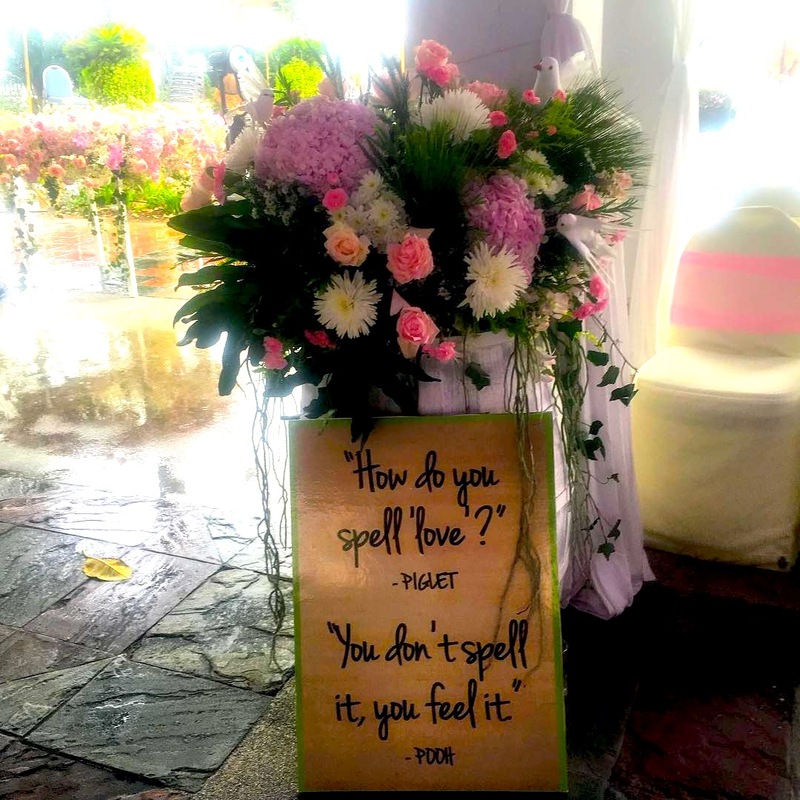 Little details made her wedding functions super personal and detailed. 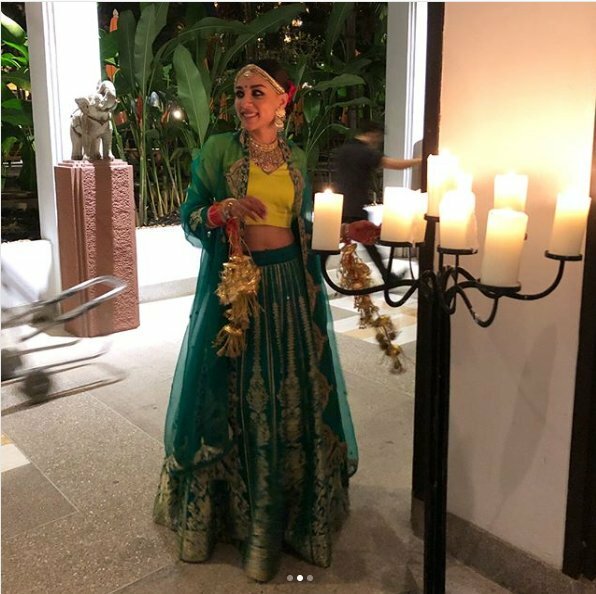 Night Hindu Wedding With A Unique Green Bridal Lehenga! 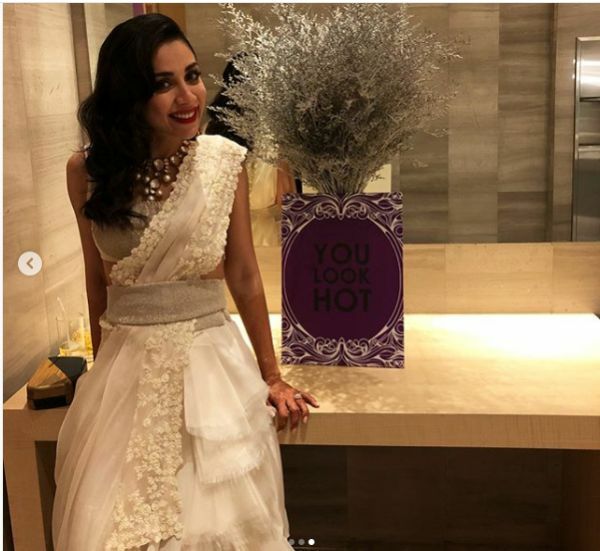 The Aisha actress wore a pretty green Banarasi lehenga (looks like a Sanjay Garg piece) paired with a lime green top, and accessorised with a gorgeous choker and a mathapatti. 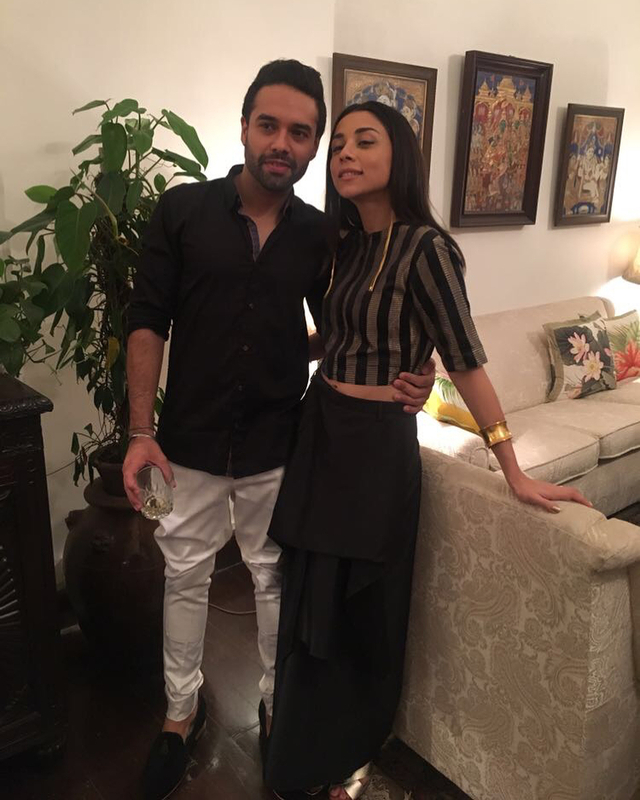 Love how she draped her dupatta uniquely – like a queen! 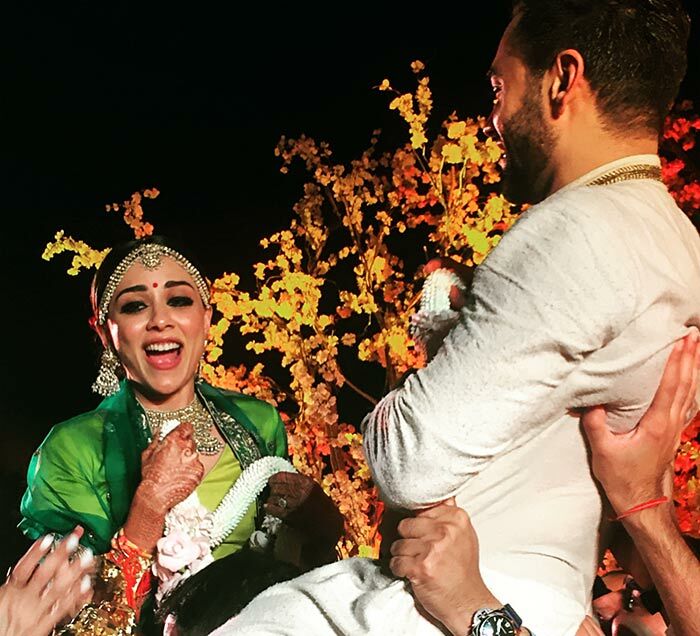 The bright red flower tucked in her bun contrasts beautifully with her green lehenga. Getting Ready For The Wedding In A Fabulous T-Shirt Dress! Lastly, don’t miss Amu’s glittery golden t-shirt dress with a mesh lining, which she wore while getting her wedding makeup done. It’s a great idea to feel comfy and get trendy makeup pictures at the same time. 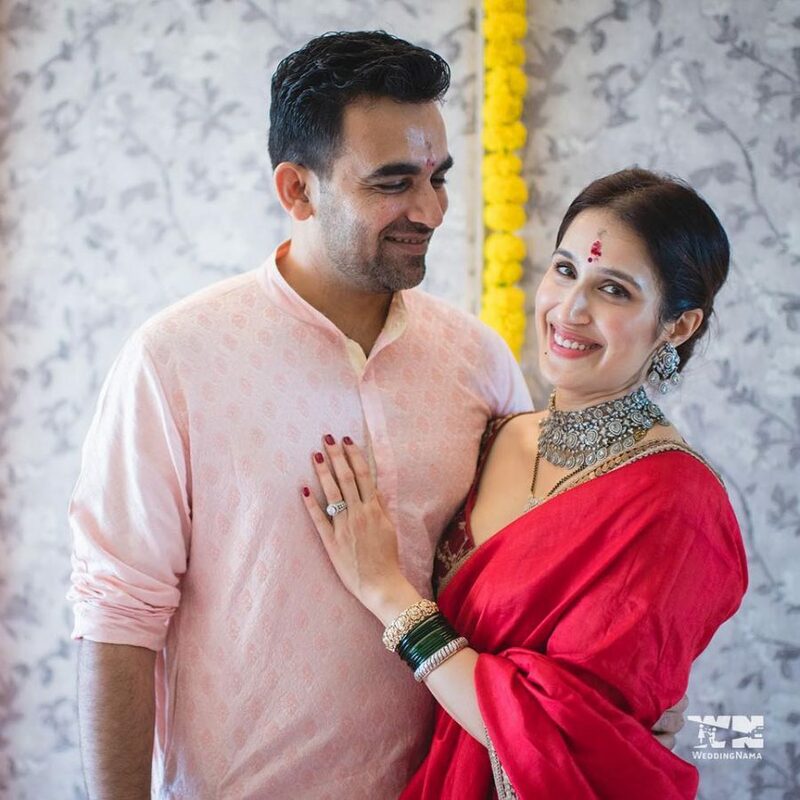 Actress Sagarika Ghatge married to Zaheer Khan – Her Sari & Jewellery Are #WeddingGoals! 2 Our Favourite Lehengas from Manish Malhotra’s India Couture Week 2017 Show! 3 60 Nath Ideas Every Type Of Bride Will Love!